There is none of the hiss that accompanies a train on electrified rails. This transit vehicle runs on rubber tires and pavement as it glides down a test track opened Dec. 20 by the Jacksonville Transportation Authority. 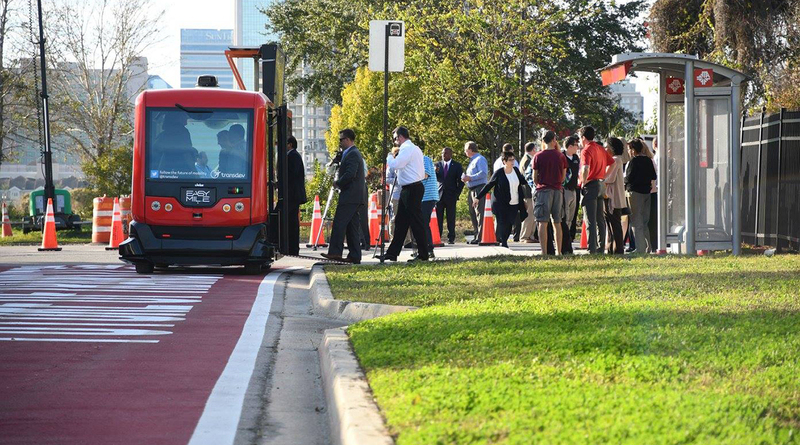 The futuristic appeal of the autonomous vehicles that began operating Dec. 21 on the JTA test track is the prospect that eventually hundreds of them could be shuttling passengers around downtown in a technologically sophisticated network using the existing Skyway structure, which is elevated above streets, and also cruising at street-level to more parts of downtown and outlying neighborhoods like Brooklyn, Springfield, LaVilla and San Marco. In four to five years, JTA plans to retire the Skyway trains and replace them with the autonomous transit shuttles. JTA will to give the public a chance to hop on those vehicles and sound off about about different models that will be rotating through a demonstration track off Bay Street at the sports complex. “What we will learn over the next two years will help set the platform of public transportation in Jacksonville for decades and generations to come,” JTA CEO Nat Ford told a crowd that gathered at Intuition Ale Works before crossing Bay Street to the test track. “We need to really look at the ‘what if’ scenarios and work our way through that,” Ford said Dec. 21 at the test track.